Well, my fellow East Tennessee history aficionados, the wait is over. The McClung Museum’s special exhibit Knoxville Unearthed: Archaeology in the Heart of the Valley opened last Friday night, and it’s quite spiffy. Kudos to the co-curators, archaeologists Charles Faulkner and Tim Baumann (bonus points to the latter because he’s a fellow Marble Springs board member), exhibits preparator Christopher Weddig, and all the other folks who helped make it happen. It’s a fantastic 225th birthday present for the city. 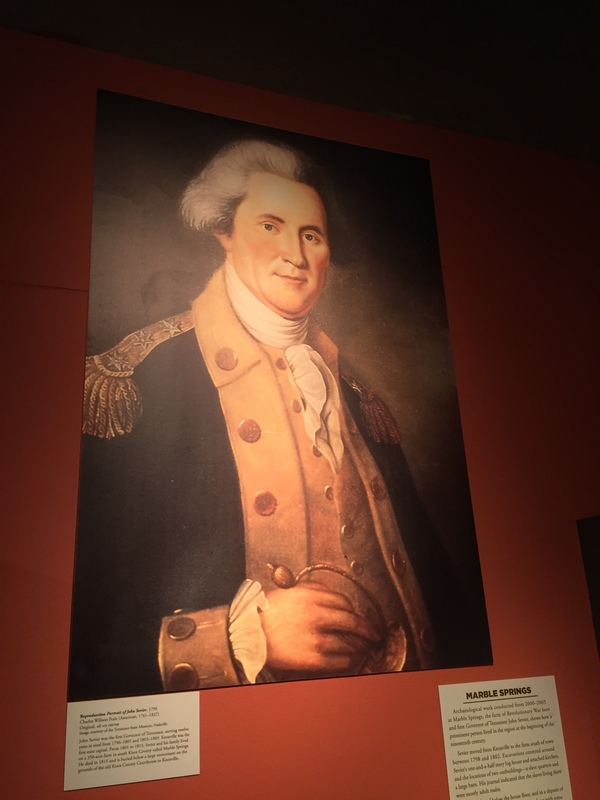 The exhibit covers Knoxville’s transition from a rough frontier settlement into an industrialized city, but being an eighteenth-century guy, I’m most excited about the early stuff. Let’s take a look at some highlights. Before there was a State of Tennessee, Knoxville was the capital city of the Southwest Territory. 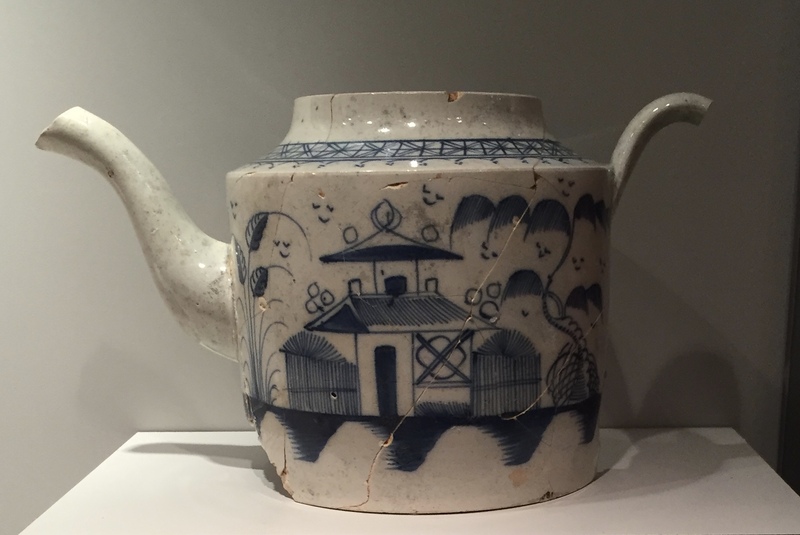 This English-made teapot was found at the site of the office Col. David Henley occupied after his appointment as agent of the Department of War in 1793. It was the same location where, in 1796, a convention met which drafted Tennessee’s first constitution. Remember our visit to Tellico Blockhouse back in July? 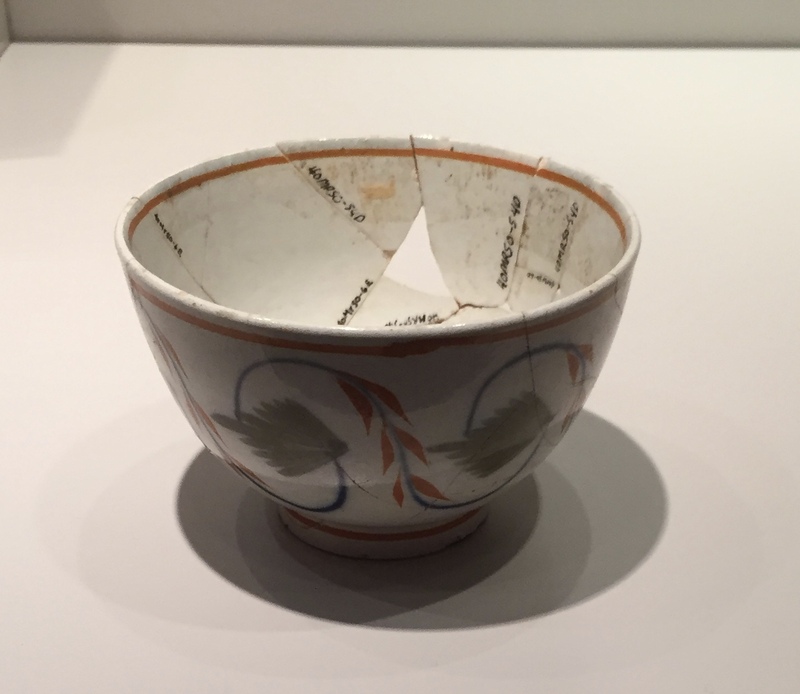 Here’s a pearlware teacup recovered from the site, dating to the period when the fort was an active frontier post. East Tennessee’s original historic inhabitants are represented in the exhibit, too. 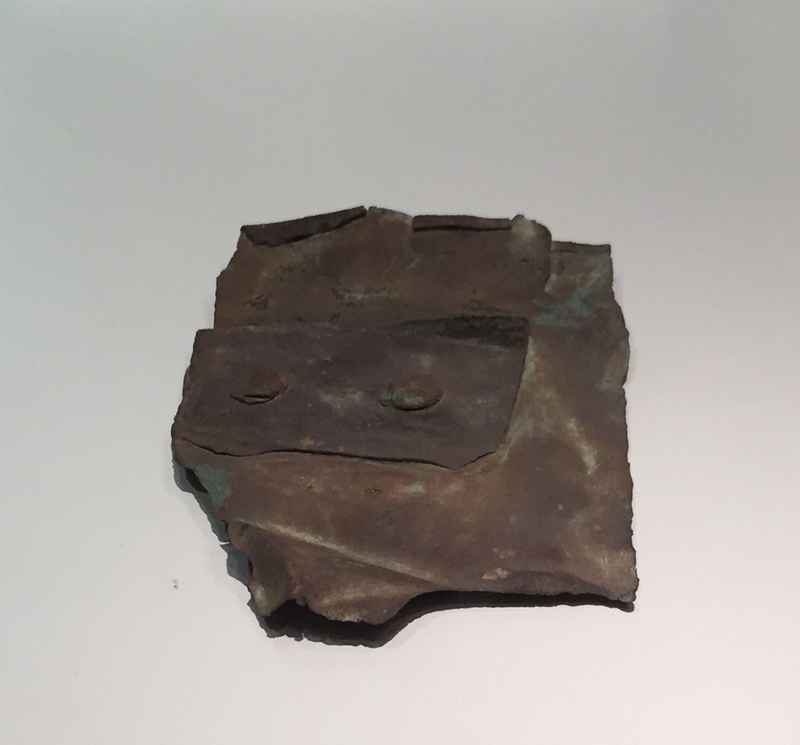 The archaeological record contains traces of items they obtained in trade with Anglo-Americans, like this eighteenth-century brass bucket fragment from the Cherokee town of Tomotley. Trading with whites didn’t mean the Cherokees slavishly adopted whatever products they obtained, however. Sometimes they repurposed Anglo-American goods into something new. A brass kettle from England might end up as ornamental tinkling cones, like these examples from Chota. James White was the first Anglo-American settler to take up residence in Knoxville, moving here with his family in the mid-1780s. 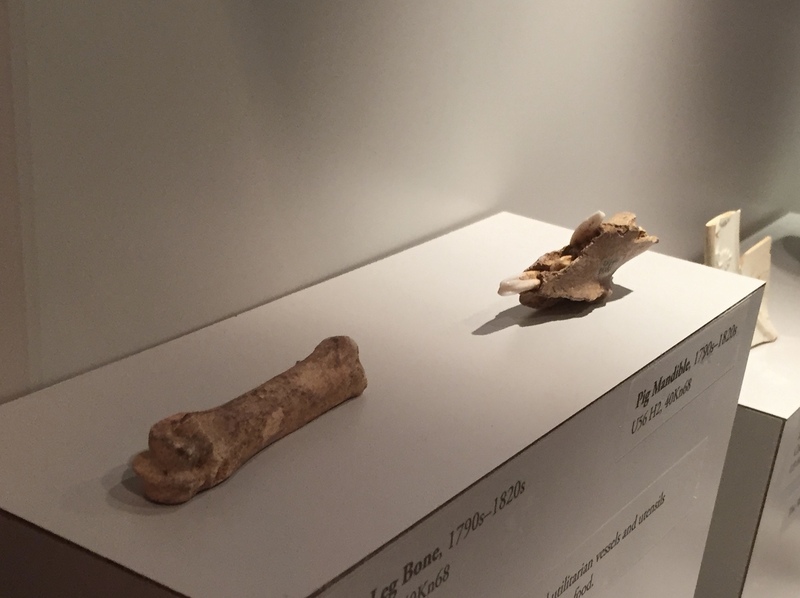 These bones belonged to a pig that ended up on the White family’s table. Pork was an important staple of pioneer diets in the southern backcountry. I’m delighted that artifacts from Marble Springs figure prominently in the exhibit. 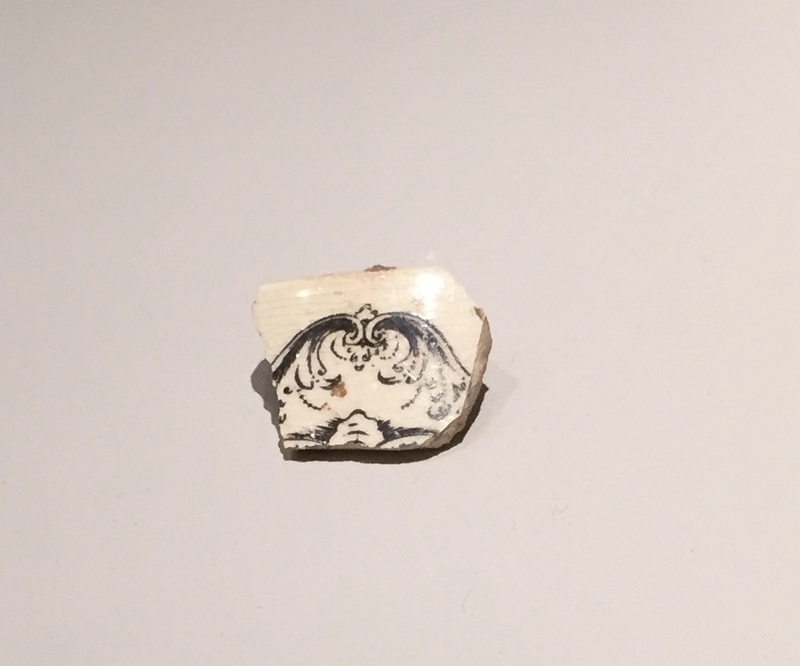 Teams of archaeologists from UT conducted excavations at the site in the early 2000s, but this is the first time their discoveries have been on display for the public. …and a small piece of a pepper shaker. Perhaps Nolichucky Jack used it to add a little flavor to his food while mulling over how much he hated Andrew Jackson. 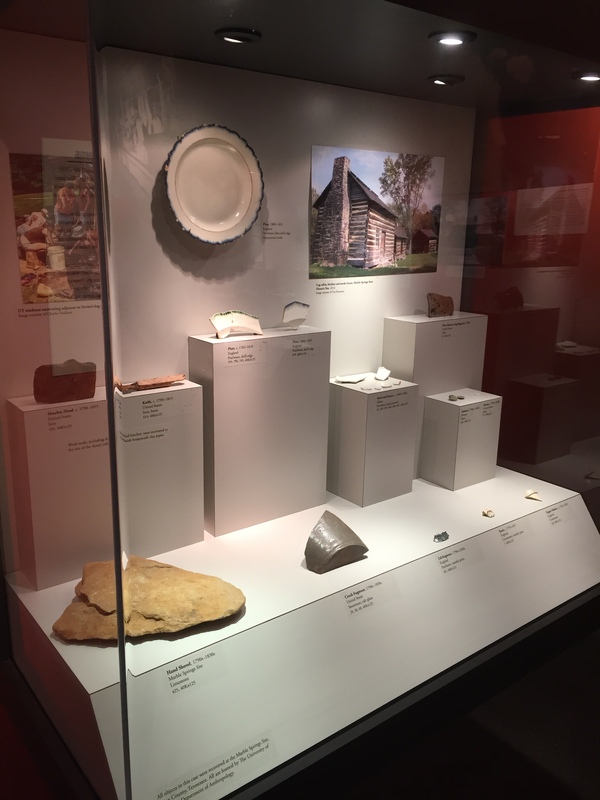 Ceramics recovered from Marble Springs indicate that while Sevier lived pretty well, he wasn’t using the finest dinnerware available on the early frontier. But he was wealthy enough to have other people doing his work for him. This hatchet head and knife were recovered from the location of one of the slave cabins. They offer a tangible link to men and women we know mostly from brief, passing references in Sevier’s journal. 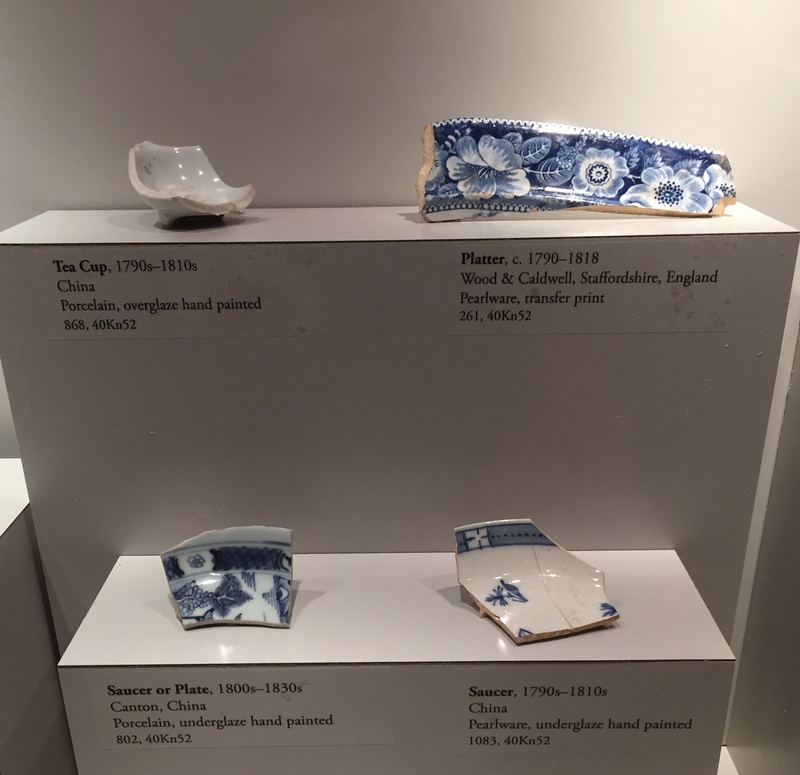 …while fragments of English and Chinese ceramics indicate that slaves used hand-me-down dinnerware from their owners. About a year ago, as you may recall, we paid a virtual visit to Ramsey House. When Francis Ramsey took up residence in the Knoxville area in the 1790s, he initially lived in a log cabin. Later, after completing the impressive stone house that is still standing to this day, he seems to have used the log building as an office. In the nineteenth century, the log structure changed functions again, this time to a slave quarters. 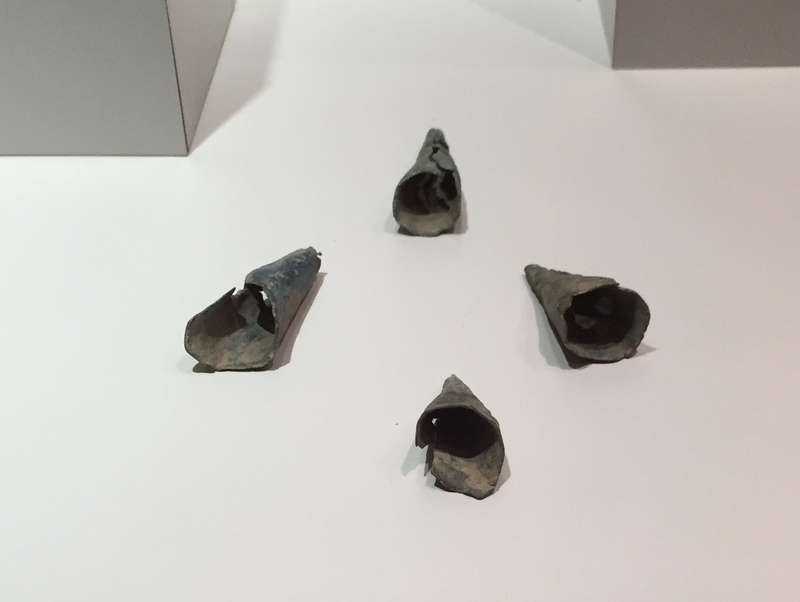 Here are a few bits and pieces recovered from the site, including another amulet. 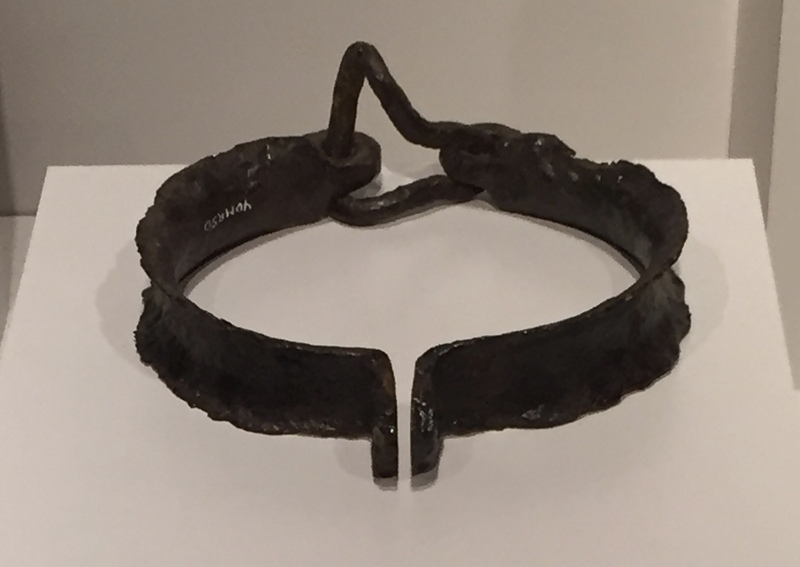 Finally, this may be the most poignant item featured in the exhibit, a neck restraint dating from the late eighteenth to early nineteenth century excavated from the Tellico Blockhouse site. 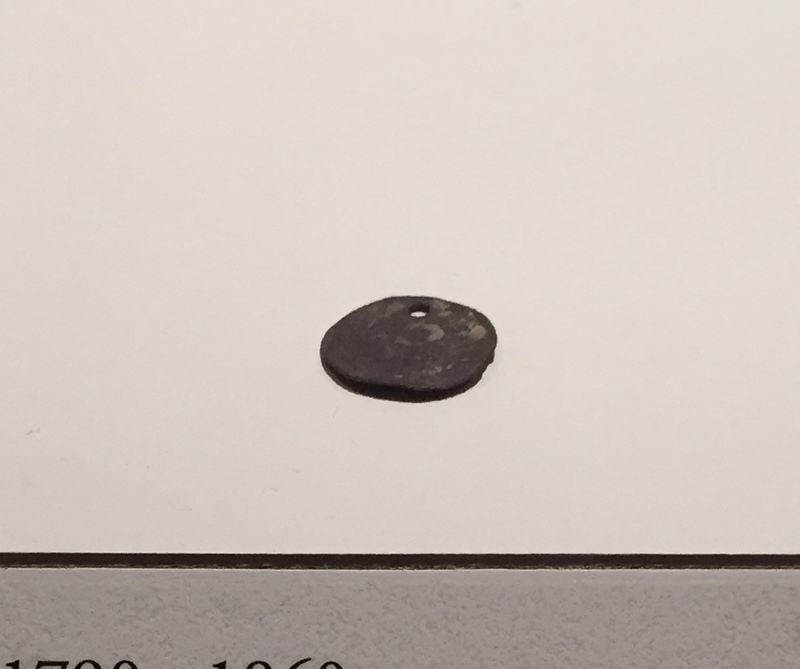 Little wonder the enslaved inhabitants of early Knoxville carried those amulets; they needed all the good fortune they could get. And we haven’t even gotten to the later nineteenth- and early twentieth-century artifacts yet. 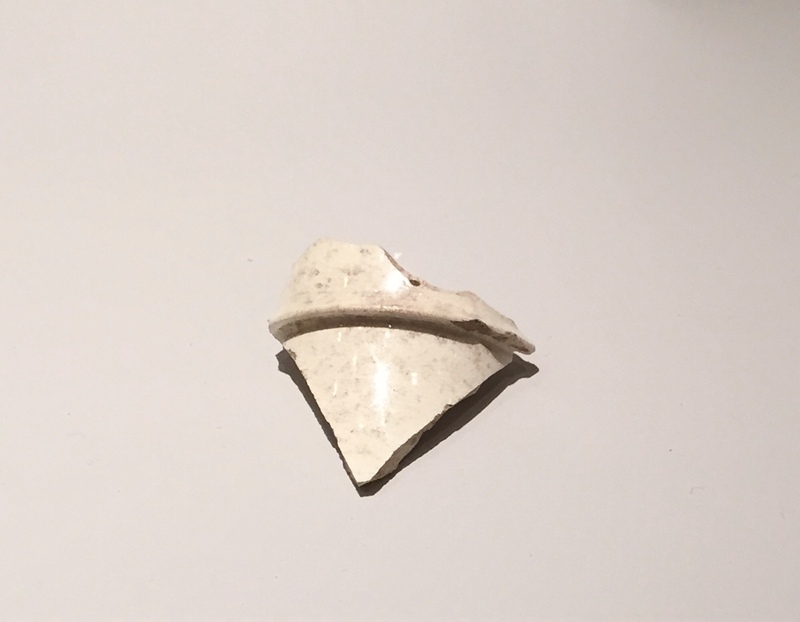 Knoxville Unearthed runs until January 8, 2017. Admission to the museum is free, so stop by and check it out. When does it count as “American history”? To put it bluntly, I’ve observed the following patterns in how we casually talk and write about individuals in the past. It’s obviously not as simple as that, but I think when we’re confronted with a dominant versus a non-dominant group, our analytical brains go in different directions; for the dominant group, we go broad, and for the non-dominant group, we go narrow. Bingo. I think we all have a tendency to think of “American history” as having a sort of default setting, and that default setting is basically the history of white guys on the northeastern seaboard. If you’re not white, not a guy, and not a resident of the northeastern seaboard, then we assume that your history is a part of American history, but it’s not really synonymous with “American history.” Instead, we assume that it’s some particularized subset of history: women’s history, black history, regional history, gender history, Western history, etc. …it’s hard to justify the assumption that the history of this region doesn’t speak to American history as a whole. It’s a pretty good-sized chunk of the country. …”America” suddenly looks a whole lot smaller. 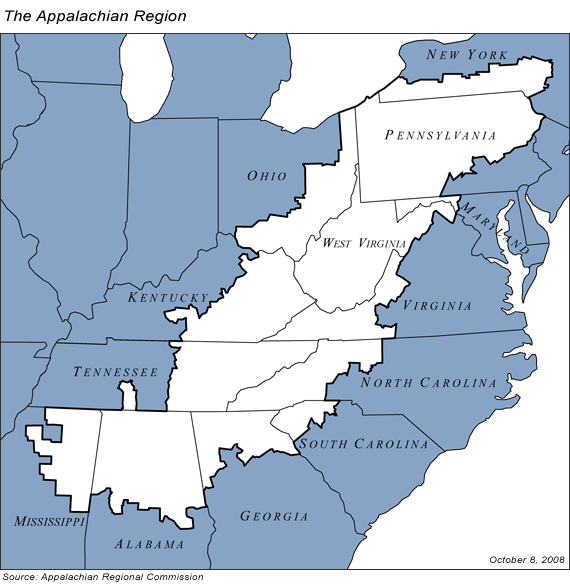 The issue isn’t that there are concerns that are rightly specific to or more pronounced in Appalachian history, Western history, women’s history, black history, Catholic history, and so on. Any discipline will develop specializations, and historians who specialize will inevitably engage in scholarly conversations that will be of particular interest to others in the same sub-field. The issue, rather, is our tendency to see certain sub-fields as nothing but sub-fields while turning others into stand-ins for the discipline as a whole. “American history” isn’t synonymous with the history of white Protestant guys in the northeastern U.S. And the best way to drive that point home, I think, is for everyone who works on the history of non-dominant groups to be as bold and daring as they can when it comes to thinking about how their projects speak to the entire discipline of American history. Don’t think of yourself as a scholar of a marginalized subject; think of your subject as a vehicle to approach American history from a different perspective.